The term osteoimmunology was first used about 10 years ago by Joseph R. Arron and Yongwon Choi in their article Osteoimmunology: Bone Versus Immune System in Nature. Since then, a number of articles have appeared in the scientific literature with this term in their title. A Wikipedia article on the subject has also been available since July 2007, though it is only in English and is not (yet) very comprehensive. There have also been occasional conferences that explicitly included osteoimmunology, for example the 3rd International Conference on Osteoimmunology: Interactions of Immune and Skeletal Systems coming up end of this month in Greece (20-25 June, 2010). In addition, the Deutsche Forschungsgemeinschaft (DFG) has initiated a new area of concentration called Immunobone, in order to promote this area of research and to facilitate networking between the various research groups and numerous different studies. It seems that things are happening in this area of research, so I have looked into this subject for the ORGENTEC Autoimmunity Blog and have summarized in this post what I learned on the subject. This article cannot be all encompassing, so I ask for your understanding up front. However, I hope that you will gain a better understanding of this concept and what is currently happening in this field. For further reading, there are many good and informative links, many to articles that you can download for free from the Journal websites or through PubMed Central, at the end of this post. What is osteoimmunology all about? First: How do the immune system and its components affect bone development? Second: What influence does bone, particularly bone marrow, have on the white blood cells (lymphocytes)? Third: What effect do stress and hormones have on the immune system/bone unit? In Germany alone, over ten million people are affected by bone diseases, including rheumatic diseases (often just referred to as “rheumatism”), osteoporosis, or bone cancer. This is more than a tenth of our country’s inhabitants! Observations have long suggested that our skeletal system and our “defence organ”, the immune system, are very tightly bound together. For example, chronic inflammatory reactions subsequent to an excessive immune reaction can damage the bones. This is the case with rheumatoid arthritis (RA), as well as ankylosing spondylitis (AS, Bechterew’s disease). Conversely, the bones – in particular the bone marrow – are one of the primary locations in which cells of the immune system mature. The precise ways in which the bones and immune system influence each other have not yet been fully researched. One area of focus for osteoimmunologists is inflammatory rheumatic disease, such as rheumatoid arthritis (RA) or ankylosing spondylitis (AS, Bechterew’s disease). Ankylosing spondylitis: An ankylosing spine in which the vertebrae become fused together. Rheumatism experts designate AS as the “the essential disease, when talking about inflammatory rheumatic diseases of the spinal column.” About 0.5 to 1 percent of people in Central Europe are affected by this disease, as estimated by the German Bechterew’s Disease Association (Deutsche Vereinigung Morbus Bechterew) and the German Rheumatism League (Deutsche Rheuma-Liga). The typical course of ankylosing spondylitis involves the ossification of entire sections of the spinal column, which consequently lose their flexibility, according to Dr. Martina Rauner, director of a group conducing research on ankylosing spondylitis at the Carl Gustav Carus University Clinic in Dresden. Interestingly, many AS patients develop osteoporosis while simultaneously growing bone spurs; they are thus losing more bone mass than they are building up. Martina Rauner and her group are attempting to resolve this paradox – a question typical of those being investigated in the field of osteoimmunology. There is a close relationship between the bones and the immune system. Bones are not only the body’s scaffolding, they are our central store of calcium and the place where stem cells mature. The different blood cells – blood platelets, red and white blood cells – are all formed in the bone marrow. 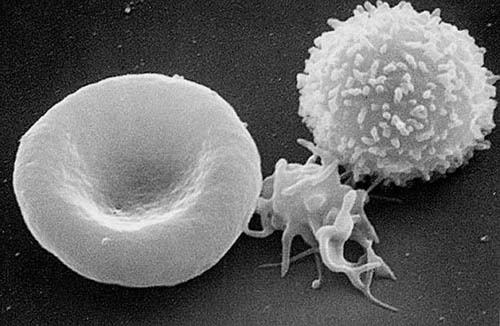 The white blood cells develop into the main players in our immune defence, monocytes and lymphocytes. Only in recent years have researchers determined that the immune system, with its immune cells and messenger molecules, directly influences bone remodelling processes. The recognition that bone and its cells, especially the osteoclasts and osteoblasts, have a direct influence of the immune system is also relatively recent (see the review Osteoimmunology by Martina Rauner, Wolfgang Sipos, and Peter Pietschmann; a free download). In various studies of the 1990s, scientists demonstrated that when inflammation occurs, the body releases certain messenger substances that influence immune cells. The most well known of these substances was called TRANCE by its discoverers, and is made by a specific subgroup of white blood cells called T cells. TRANCE stands for TNF-related activation-induced cytokine. Today, the term RANKL (receptor activator nuclear factor kappa B ligand) is more common. RANKL and other inflammatory messengers induce the production of more osteoclasts, bone-removing cells. The exact mechanism involved is not yet clear. Because of the dramatic consequences that inflammatory diseases and autoimmune diseases sometimes have on joints and bones, the connection between these diseases and bone loss is considered certain. But back to the scientists at the University Clinic in Dresden and the research team led by Martina Rauner, who are tracking down the changes to the bone metabolism in patients with ankylosing spondylitis. Their central question is: how does the inflammatory reaction in ankylosing spondylitis contribute to bone loss? By using an animal model, the scientists were able to show that inflammation of the spine causes increased activation of T cells. These activate osteoclasts, which in turn dismantle more bone than the bone-building osteoblasts can add (from a news release by the Technical University of Dresden [in German]). Gaining a better understanding of the bone changes that occur in rheumatic diseases is only one goal that osteoimmunologists have set themselves. A second important component of osteoimmunology concerns the significance of the bones, especially the bone marrow, to the white blood cells, or lymphocytes. Human bone marrow: faithful reproduction of a lithograph plate from “Gray’s Anatomy of the Human Body”, originaly published in 1918. It is now known that immune cells, especially lymphocytes, require a specific microenvironment for their development and survival. In this way, for example, bone marrow acts as a survival niche for long-lived plasma cells, one type of lymphocyte. These cells ensure immunity against pathogens by “remembering” them, sometimes for several years. Recently, a research group at the German Rheumatism Research Centre (Deutsches Rheumaforschungszentrum, DRFZ) demonstrated that a very similar hiding place exits for the T helper cells (TH1 cells) that are involved in the inflammation due to rheumatoid arthritis (RA) (Tokoyoda et al. 2009, see abstract). Rheumatic inflammation in RA occurs in a flare-up pattern: after a period of remission the symptoms return, often in different joints. The triggers for these flare-ups are cells known as memory T lymphocytes, which store the memory of earlier attacks. The immune response can thus be initiated again and again, up to 100 times as intensely as the original response. Before, researchers assumed that the memory T cells are constantly circulating in the blood. However, the study by Dr. Koji Tokoyoda of the DRFZ showed that the memory T lymphocytes have what amounts to a “permanent residence”: a few weeks after they are formed, most of them retreat to the bone marrow, where they dock firmly onto connective tissue. When in this resting state, their metabolism slows. It takes renewed contact with the specific antigen the cells remember as foreign to wake them up. Dr. Tokoyoda and his group demonstrated that the cells then activate the B cells, which set into motion a renewed inflammatory reaction by producing specific antibodies. One approach to future RA treatments is to suppress this “immunological memory”. While in the bone marrow, these memory cells remain unreachable by previous treatments. The more scientists know about the way T helper cells operate, the closer they can come to this approach for new treatments for rheumatoid arthritis or other immune diseases: the targeted neutralization of the memory T cells. Osteoimmunologists are also conducting research into the effects of stress and hormones on the immune system and bones together. Both influence the immune system – and thus, following the logic of osteoimmunology, also the bones. It has been demonstrated that certain nerve fibres contain cytokine receptors and can be influenced by TNF alpha (free article in Arthritis & Rheumatism). There is thus a direct relationship between the immune system and the onset of pain. Alternatively, processes in the nervous system can also change immunological processes. In general, the nervous system influences inflammation by means of certain areas of the brain as well as the sympathetic and parasympathetic nervous systems. Whereas the sympathetic nervous system can have effects that promote inflammation or inhibit it, the parasympathetic nervous system has an overwhelmingly anti-inflammatory effect. Certain neuropeptides that are released directly into the tissue by peripheral nerves can also promote inflammation. These cause blood vessels to expand, increase their porosity, and stimulate the production of inflammation mediators through local and migrating cells. The neuropeptides can also dock to the receptors on macrophages, the scavenger cells of the immune system, which further advances the inflammatory process. I find the interdisciplinary aspect of the new field of osteoimmunology to be particularly fascinating. Osteoimmunological research groups include rheumatologists and immunologists, geneticists and tissue biologists, as well as scientists working in molecular and cell biology. Endocrinologists, orthopaedists, and trauma surgeons also make contributions, and biomechanics and neurology are also involved. These scientists are promising a lot to both patients and doctors: they intend to deliver completely new approaches to treatment. New treatments should intercede directly in the bone metabolism in cases of inflammatory rheumatic diseases to stop the destruction of bone in cases of rheumatoid arthritis (RA) or ankylosing spondylitis. – I can’t wait to see what osteoimmunology will bring us in the future! 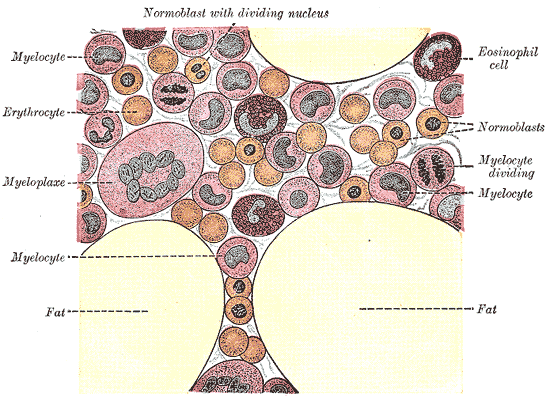 pictures taken from Wikimedia Commons: blood_cells, ankylosing spine, reproduction from Gray’s Anatomy. All works have been released into the public domain. My Dad has multiple myeloma. He had chemo. Stem cell transplant with own cells. Was fine until he received a “reimmunization” polio shots July 2012. Since then he has re-occuring high fevers as high as 104-5. They debilitate him. They have sone all sorts of testing with no avail. Come across any answers in your research which could explain why this is happening? Thank you for posing this question in our blog. I can understand that you are looking for an explanation for the severe health problems of your Dad and I feel with you. But first of all I want to emphasize, that you should NOT quest for personal medical advice via the internet. Every disease is individual, and under different circumstances similar symptoms may have different causes. I strongly recommend that you discuss these issues with a medical doctor of your confidence. He or she will give you advice while taking into account all aspects of the clinical picture. Concerning the blog post you are refering to, it is covering topics of basic research in osteoimmunology, a nascent research field that is still far from providing clinical solutions. But I am convinced that this will change in the near future. I whish you all the best for you and your Dad.